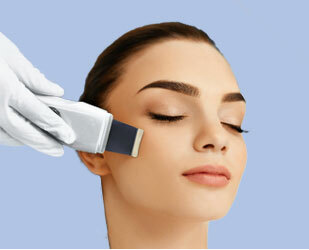 The Ultrasonic Facial is a gentle, non-invasive, safe treatment that features three treatment phases. This Ultrasonic Facial can be performed on almost all skin types making it an excellent choice for those with acne, mature skin, and even overly sensitive skin, including Rosacea. Phase 1 – Cavitation or Exfoliation: Exfoliation is done using distilled water and Ultrasonic vibrations. This allows safe and effective removal of approximately 20% to 50% of the stratum corneum, or the outermost layer of skin. Phase 2 – Sonophoresis Infusion or Product Infusion: The second phase features ultrasound that is customized to your skin. The device works by dramatically increasing the depth and rate at which these active ingredients are absorbed into the layers of the skin. Your aesthetician will select a custom serum to infuse that’s best for you and your concerns (e.g. antioxidant, hydrator, light peel/brightening serum, moisturizer or salicylic acid (for clogged pores)). Phase 3 – Microcurrent Therapy: This is where all the magic happens! This phase is medically proven to restore natural electrical charge for individual cells. When cellular damage occurs due to environmental causes, like overexposure to the sun or aging, the cells electrical current is adversely affected. This phase helps to restore the electric current and to promote healing and cell regeneration. Our custom facials are tailored for each client to improve and rejuvenate the skin. We specialize in acne, rosacea, teens, and pigmentation. Our advanced Ultrasonic Skin Treatment System incorporates environmentally safe water with low-frequency sound waves for superior exfoliation. What is an Ultrasonic Machine? The Ultrasonic Facial Machine is a machine with a metal paddle attached on the end of it that uses a low-frequency ultrasonic vibration to deeply penetrate dirt and grime on the face. It is completely safe and highly effective, with no downtime, redness or pain.Your skin feels very clean and hydrated after this treatment. In fact, it is extremely popular with our patients who wish to have a Custom Signature Facial experience and the added benefits of the Ultrasonic treatment. Our certified estheticians customize the Ultrasonic Facial experience and maximize the results based on the individual patient’s goals, skin tone, and composition. For more information about Ultrasonic Facials or any other cosmetic treatment options, don’t hesitate to call us to schedule an appointment.